A body-cam video shows officers responding to a burglary at a local business. The suspect is ordered out of hiding and appears to comply with the officers demands. One officer even tells him if he puts his arms down it will be a bad day… The suspect in his infinite wisdom decides to test that theory. 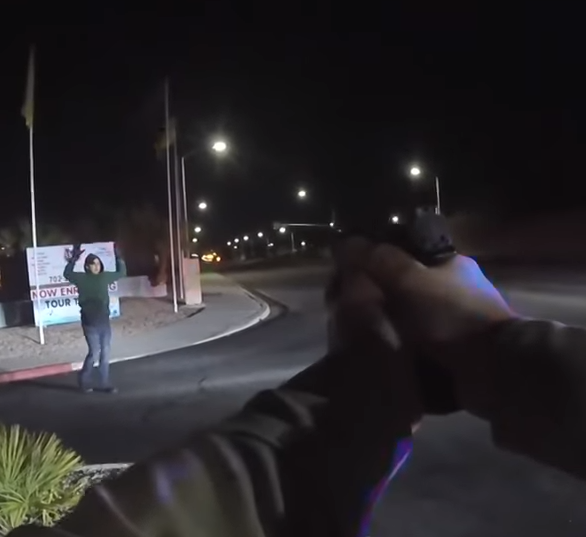 KTNV Reports that Las Vegas police are sharing new details and body camera footage of two recent incidents, a police involved shooting on March 16. On March 16 around 9:30 p.m. officers responded to a burglary call near Eastern Avenue and Robindale. Police say 20-year-old Steven Aguirre is suspected of robbing an Auto Zone at gunpoint, then fleeing the area on foot. Just before 10:20 p.m., police located Aguirre near Fountain Heights Lane and Robindale Road. Police say, Aguirre had a gun in a holster on his right hip and was ordered not to touch it. Aguirre was initially complying with commands, police say, but he eventually attempted to grab his gun. That’s when Officer Darko Milanovic fired a single shot at Aguirre. Ghost Gun Dealer Sued By New Jersey! BREAKING! Senate Judiciary Committee is holds a hearing on Red Flag Laws!